Lowe’s new Direct Fulfillment Center, located a half hour outside of Nashville, covers more than 1 million square feet, and was established with the goal of increasing the efficiency of shipping parcel packages directly to Lowe’s customers and stores nationwide. With hydrogen-fuel cell-powered equipment and a state-of-the-art automated storage and retrieval system, this facility will be one of the company’s most technology-driven operations. The center’s employee experience is a focus throughout the manufacturing floor, as well as in the 43,000 sq. ft. office and maintenance area. 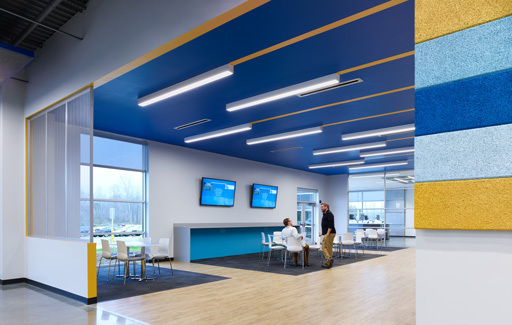 Vibrant colors bring visual energy to this space, and a large cafeteria, gaming/technology spaces, and an exterior courtyard are all areas where employees can relax and “recharge” during their shifts.